allows you to record, import and export tracks onto your iPhone. Trails is really nice, it records and show position and altitude. It also allows you to cache map tiles when you have a good connection to use later on a walk. You can zoom in quite close and it has already been handy in finding out I was going the wrong way in the mist. Trails allows you to email a track in both kml and gpx format. Clicking the kml file opens the trail in GoogleEarth. 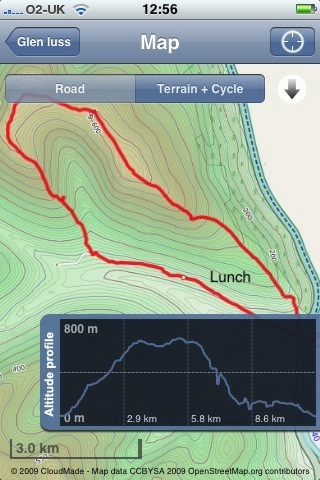 I’ve been using GPSPhotoLinker a free app to add geotags to photos using the gpx track from Trails. Once you have dome that they will be mapped by flickr. 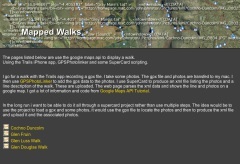 I’ve then been using .SuperCard to read the data from the photos and the gpx track and produce an xml file and set of resized photos. The xml files can be used with the google maps api to show the track and photos on a google map. I’ve started to put together some webpages to list and show the maps: Mapped Walks. The idea is to end up with a SuperCard project that cuts out some of the steps, it would take in photos and gpx file and upload resized photos and xml file to the web. I just need a bit of time to write and test the scripts. I have managed to add an mp3 player to some of the google bubbles on one map that plays sound recorded on my phone. The aim is to have pictures, audio video and text. The maps now also have links in the bubbles that take you from one to the next in the correct order, I think this could be come an interesting way to tell a story that travels through space and time.